So, I have been trying to unplug Evan. He spent part of the other week in the hospital due to pneumonia and breathing complications. His doctor admitted him from the office but Evan waited 8 hours for a room at the hospital. Hour 7 when a guy started smoking an e-cigarette in the waiting room I started to think I would just take Evan home. Finally, they called Evan’s name and an orderly wheeled him towards his room. When we started going through the maternity ward Evan asked the guy if there was any other way to get to his room. The guy responded “no” and I was not sure if I was going to start crying or laughing. Evan spent a few days in the hospital and I did not take any babies while passing through the maternity ward to visit him. Evan is better and back to work. Evan and the twins have gotten sick before – I know that sickness (and hopefully getting better) is part of life. I am just not as good at handling it – maybe if Jake and Sawyer had not died I would be better with these situations. I will never know. Uggh. Not what you need. Thanks for sharing and glad Evan is home. Oh sweet friend…. I am so sorry Evan was so sick and you were filled with fear. It is hard to retrain our brains to hope and believe. I am glad he is home. Thinking of you and saying a few prayers for peace and comfort. 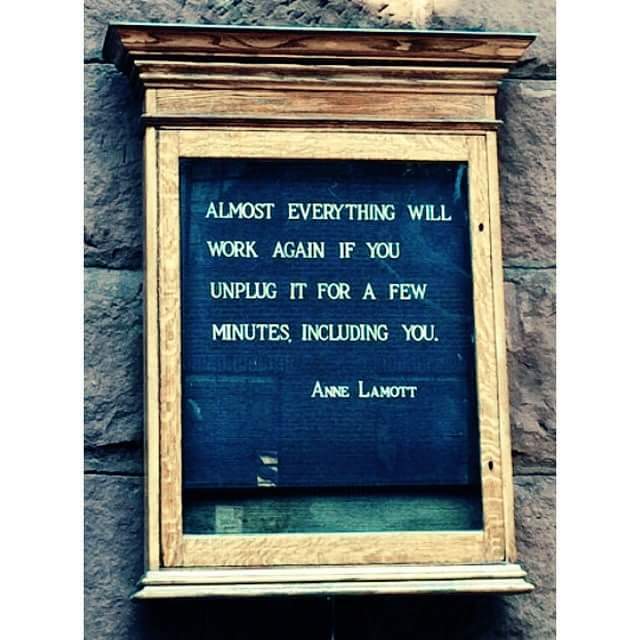 It’s true–we all need to unplug sometimes and yes, that’s easier said than done. The hospital experience is typically frought with ridiculousness–and this one was sadly no exception. We’re just glad that Evan is on the mend–but he should still be unplugging once he’s home! (And so should you for that matter!) Hugs to you all! So glad that Evan is out of the hospital and on the mend. Sending love your way.